TORI News reported earlier that Gov. 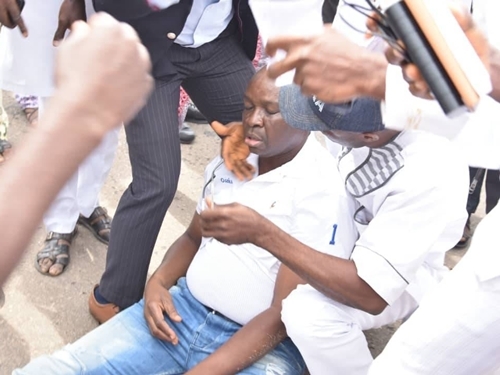 Fayose reportedly escaped death in the hands of security operatives who allegedly fired teargas at him. 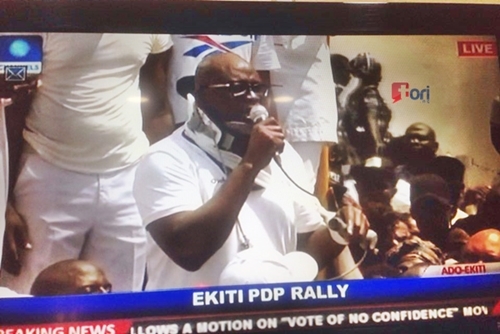 Fayose who then broke into tears lamenting said, “I am in pain, I am in severe pain. I can’t turn this neck anymore. If anything happens to me, the Inspector-General of Police should be held accountable,” the governor told reporters while crying at the rally." Earlier, Lere Olayinka, the Governor's Special Assistant on Public Communications and New Media, took to his verified Twitter page and disclosed that his principal lost consciousness and was taken to Government House clinic after policemen fired teargas canisters into the Government House. He wrote: "Gov Fayose, a few minutes ago escaped plot to assassinate him by Fayemi and his APC. He is currently receiving treatment at govt house clinic after he was hit by teargas canister fired by the policemen. The armed policeme still laying siege at the Govt House."